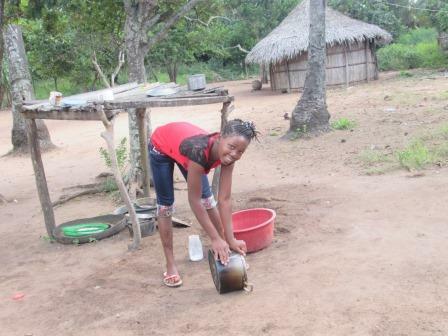 Sizina is a fourteen year old girl from Mozambique with a beautiful smile. 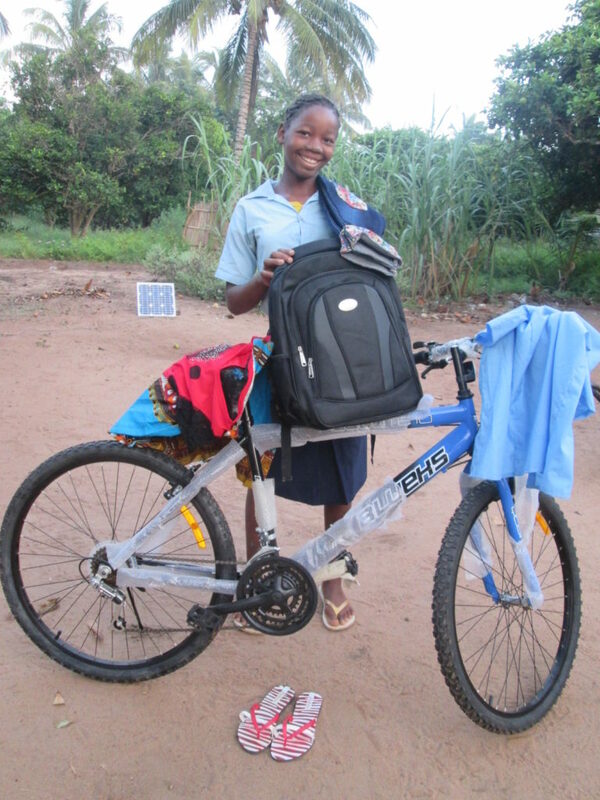 She is beaming because she just received the wonderful life-changing gift of a new bicycle, thanks to the generosity of her Irish sponsor..
Sizina is a cheerful 14 year old from Mozambique. Like many girls in developing countries, it can be a real challenge acquiring a good, regular education. One of the major reasons for this is the sheer distances that girls may need to travel daily just to get to school. Other family priorities, such as the need to source fresh water and carry it back to the home, a backbreaking chore that may in itself require walking several kilometres with heavy containers, can also hamper or disrupt schooling. Imagine having to find the time and energy to carry out these essential chores, and then having to consider a long exhausting walk of up to several miles just to get to school and start your normal routine? Now imagine how much easier this would be if you were a child and you suddenly had the gift of a bicycle? Sizina has been fortunate enough to be sponsored by a kind Irish sponsor from Co. Carlow since 2009. 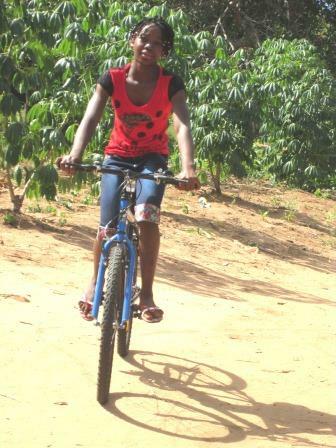 A long-time supporter of ChildFund Ireland, the donor was recently moved to provide Sizina with the full cost of a bicycle. Sizina is beaming in because this gift has made a significant difference to the quality of her daily life. To a girl like Sizina, a bike can mean liberation, not just from the exhaustion of long journeys on foot, but from the the constraints of time; affording her an element of independence and giving her the confidence to see through her education. Importantly, It can also help limit girls like Sizina from exposure to hazards and dangers that might be involved in lengthy trips away from the family domicile, such as the threat from wild animals or even from people traffickers. “I would like to be a teacher. I chose this profession because I will get to teach the children what I am learning and I will be respected in my community”. Talking about the difference the bicycle has made to her life. She says; ”now I can see the difference from the time I did not have with a bicycle…now I can get up, wash the dishes, sweep the yard and then go to school”. Many sponsors have a deeply personal relationship with their sponsor child and their family. What they frequently tell us is that it can be a hugely rewarding and uplifting experience to be involved in supporting the life of a vulnerable child; offering them a helping hand on the pathway to a happy, productive life.